This is one of my favourite German traditions. Never having really liked Christmas puddings, a dense, compact mixture of dried fruits, booze and some stuff in-between to stick it all together. Cook for a few hours, then do something else to it, cook again for a few more hours, add more booze probably, then some more sitting, waiting and cooking before you end up with an undeliciously sweet, incredibly dense heavy black pudding that is so thick with flavours, it might take the inside of your mouth off. Add yet more booze, set light to it to in some justify its presence at the Christmas table and then drench it in cream to make it palatable. As you can guess from this tiny rant, my experiences of Christmas pudding have been far from joyful. Possibly due to the fact that putting this much time and work into a pudding means…to me, it should be absolutely flipping delicious! But not that many people do anymore, so to go for the shop bought variety is much more common, and of course, lacking in whatever it is about Xmas puddings that made them popular in the first place. The German equivalent however, I find much more pleasing. It still uses the same mix of dried fruits and spices that one would want to see at Christmas, but takes the density and weight out of it. It is much lighter and cake like, but with a slight crunch on the outside. You can add whatever you fancy to the mixture, selecting your favourite spices, dried fruits and other Christmassy treats. Bake in the oven for a little while and you have a cake that has longevity (Max said it keeps for about 6 weeks in a metal tin), and can be presented and served up to visitors with tea and coffee. We decided to show here mini Stolens as well as the larger, more traditional form, sliced. But this recipe can be whatever shape or size you want it to be (adjust cooking time to compensate of course). 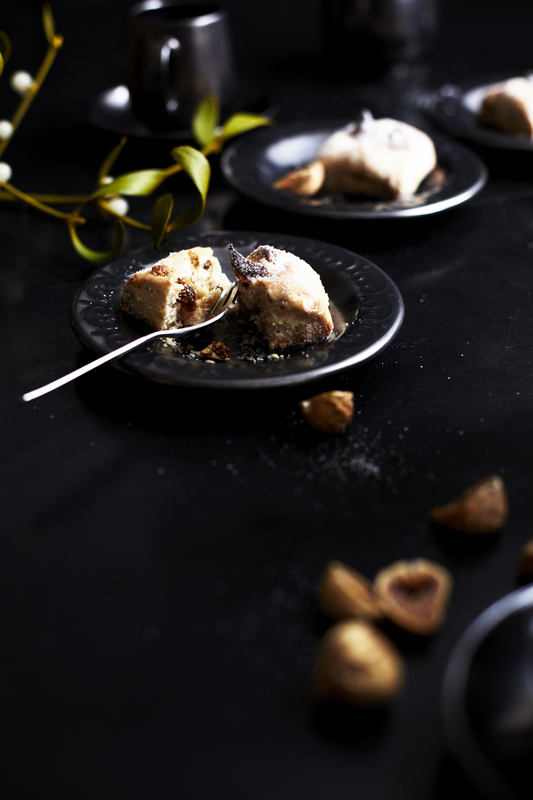 We wanted this recipe reach you just in time for December and the lead up to Christmas. Serve with Christmas tree decorating and present wrapping. 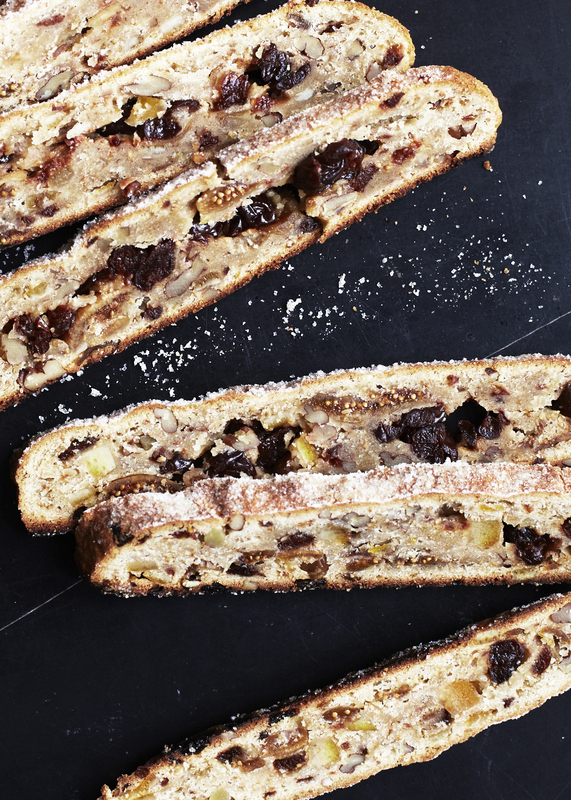 Eine meiner Lieblingstraditionen aus Deutschland: Weihnachtsstollen. Ich war noch nie ein großer Fan der britischen ‚Christmas puddings‘. Eine zusammen gepanschte Mischung aus Trockenfrüchten, Schnaps und Irgendetwas Klebrigem. Das Ganze wird für einige Stunden eingekocht, dann aufgefüllt, wieder einige Stunden gekocht, mehr Alkohol dazu, wieder warten und kochen und zum Schluss entsteht diese unappetitliche, süße, dicke, schwarze Masse, der ‚pudding‘. So vollgestopft mit Geschmäckern und schwer, dass er im Mund ein betonartiges Gefühl hinterlässt. Zu guter Letzt wird ein letztes Mal Schnaps hinzugefügt und mit Hilfe von weihnachtlichem Kerzenschein und Sahne versucht, ihn überhaupt genießbar zu machen. Bestimmt ist es unschwer zu kennen: ICH MAG KEINE ‚PUDDINGS’ und meine bisherigen Erfahrungen mit dieser Speise sind alles andere als schön. Vielleicht auch, weil ich nicht verstehen kann, wie eine so mühevolle und langwierige Zubereitung zu solch einem schrecklichen Ergebnis führen kann. Es müsste doch etwas absolut Superleckeres dabei herauskommen! Sowieso macht kaum jemand in England seinen Xmas pudding mehr selbst, meist wird er gekauft und an der Supermarktkasse verliert sich damit dann auch noch der letzte Zauber um die Tradition einer stundenlangen Zubereitung. Das deutsche Pendant dagegen, der Weihnachtsstollen, gefällt mir um Einiges besser. Auch er enthält Trockenfrüchte und die Gewürze, die man an Weihnachten einfach erwartet. Allerdings ist er lange nicht so schwer und dicht. 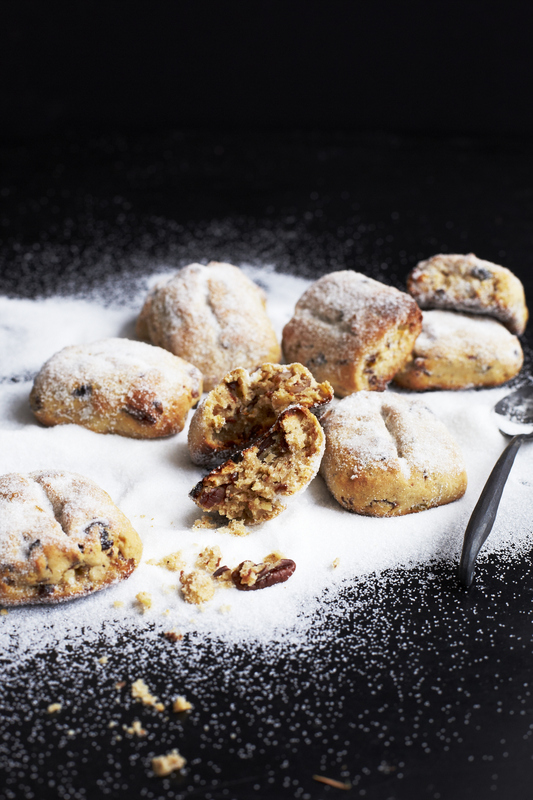 Stollen ist viel leichter und ‚kuchiger‘, mit einem leichten Crunch außen. Man kann eigentlich alles hineingeben, seine Lieblingsgewürze, getrocknete Früchte und andere weihnachtliche Leckereien. Das Ganze wird im Ofen gebacken und kann lange aufbewahrt werden (laut Max bis zu 6 Wochen in einer Blechdose). 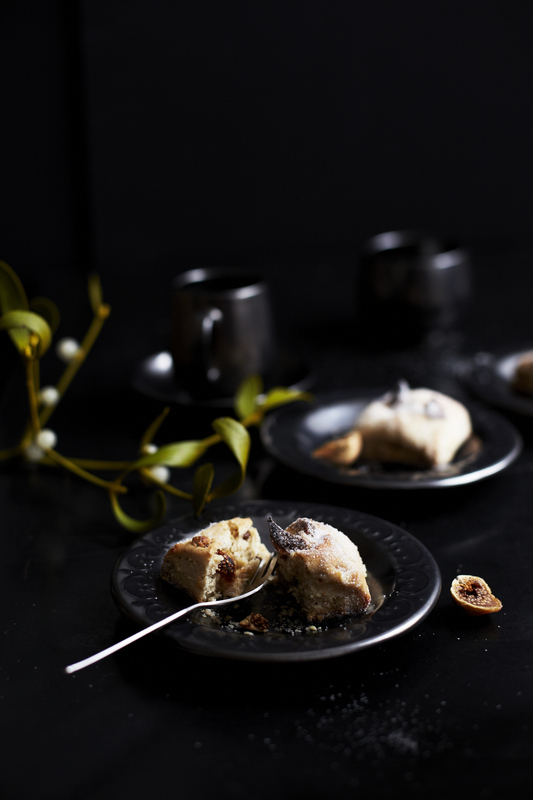 So kann der Stollen den ganzen Advent über mit Kaffee und Tee genossen werden. Dieses Rezept soll Euch genau jetzt erreichen und Eure Adventszeit versüßen! Chop the figs and pecans into small pieces and then mix together with the cherries, candied orange peel and ground almonds. Combine the flour and baking powder in a bowl, then add the remaining ingredients (except the fruit and nut mixture) and knead everything together until it forms a dough, either with your hands or with the dough hook in a mixer. Next add the fruit and nut mixture to the dough and continue kneading until smooth. On a floured surface, mould the dough into a rectangular form or split the dough into small portions and mould into mini forms. 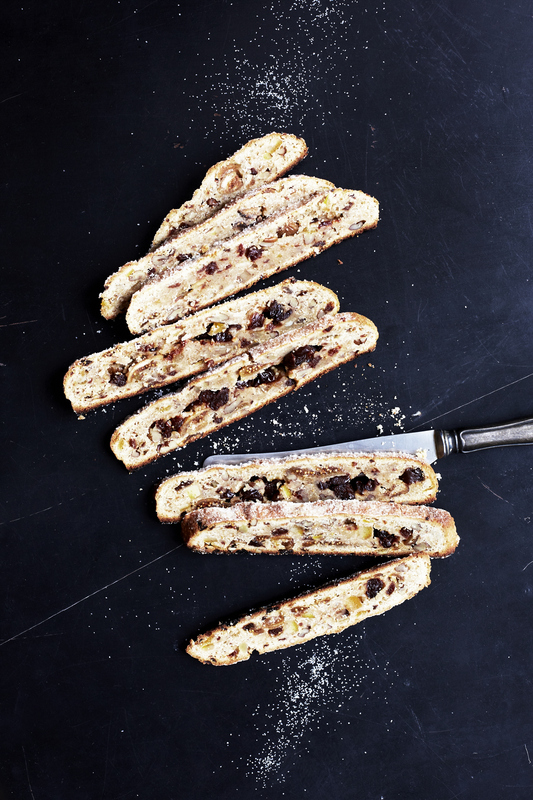 Put the Stollen/s onto a baking sheet lined with baking paper and bake in a preheated oven (electric oven 200°C/gas mark 3) for about 50 minutes. 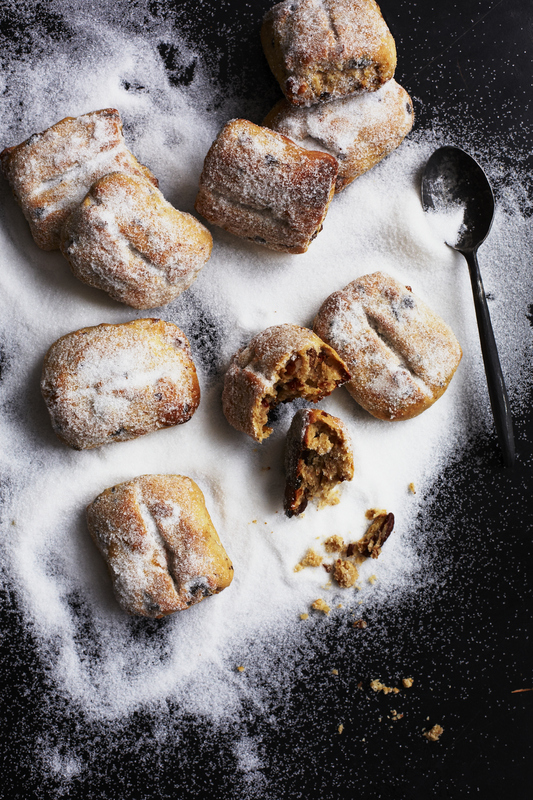 The mini Stollens only bake for about 20 minutes. When finished and still warm, brush with melted butter and roll in sugar. The Stollen/s last upto 6 weeks in an airtight container. Feigen und Pekannüsse klein schneiden. Kirschen, Feigen, Pekannüsse, Orangeat, gemahlene Mandeln mischen. Mehl und Backpulver in eine Schüssel geben und mischen. Übrige Zutaten (bis auf Feigen, Kirschen, Orangeat, Pekannüsse und Mandeln) zugeben und alles mit den Händen oder den Knethaken des Handrührgerätes zu einem Teig verarbeiten. Kirschen, Feigen, Pekannüsse, Orangeat, gemahlene Mandelmischung unterkneten und zu einem glatten Teig verkneten. Auf bemehlter Arbeitsfläche zu einem Rechteck ausrollen und zu einem oder vielen kleinen Stollen formen. Stollen auf ein oder zwei mit Backpapier ausgelegte Backbleche setzen und im vorgeheizten Backofen (E-Herd: 200°C/ Gas: Stufe 3) ca.50 Minuten backen. 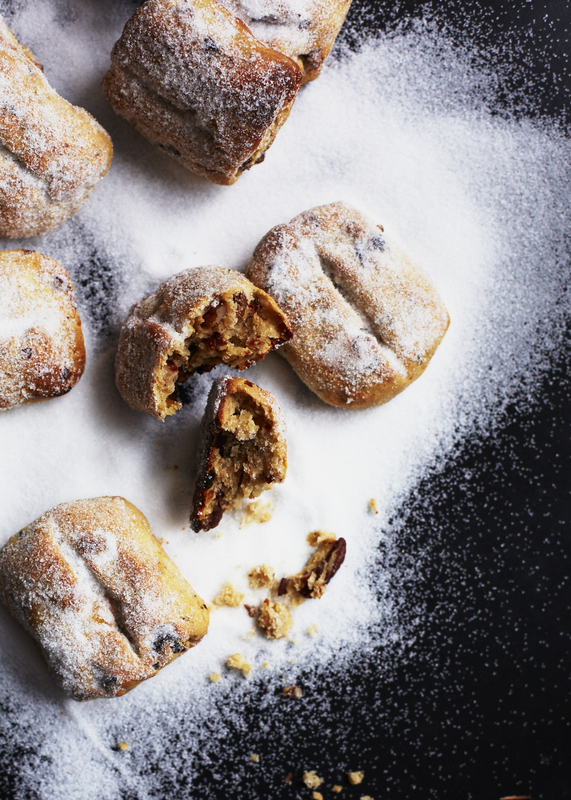 Die kleinen Stollen ca. 20 Minuten backen. Übrige Butter schmelzen, die noch warmen Stollen bestreichen und im Zucker wälzen. Die Stollen sind in Keksdosen verpackt ca. 6 Wochen haltbar und saftig. 01 Dec	This entry was published on December 1, 2014 at 10:30 am. 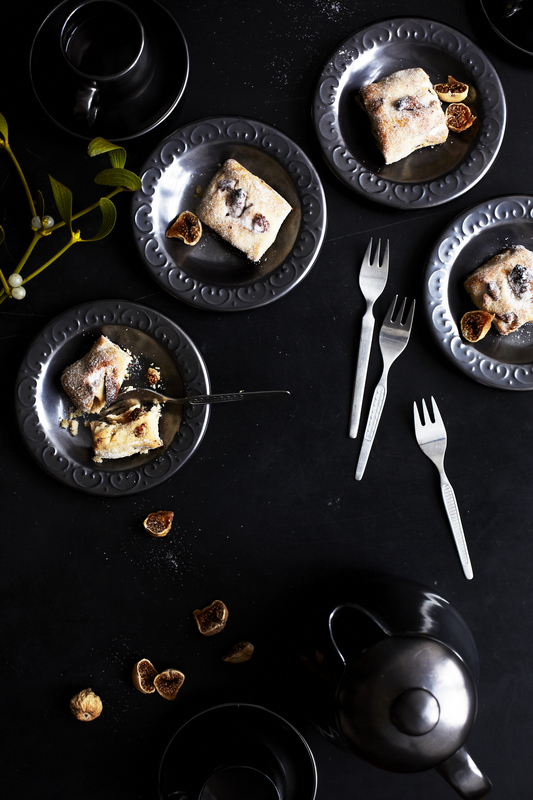 It’s filed under Uncategorized and tagged berlin food photography, berlin food styling, Christmas, Christmas Cake, Figs, food photography, food styling, German Recipe, max faber, nicky and max, Nicky Walsh, nicky walsh food photography, recipe, Stolen. Bookmark the permalink. Follow any comments here with the RSS feed for this post. Beautiful pictures! And delicious ingredients. 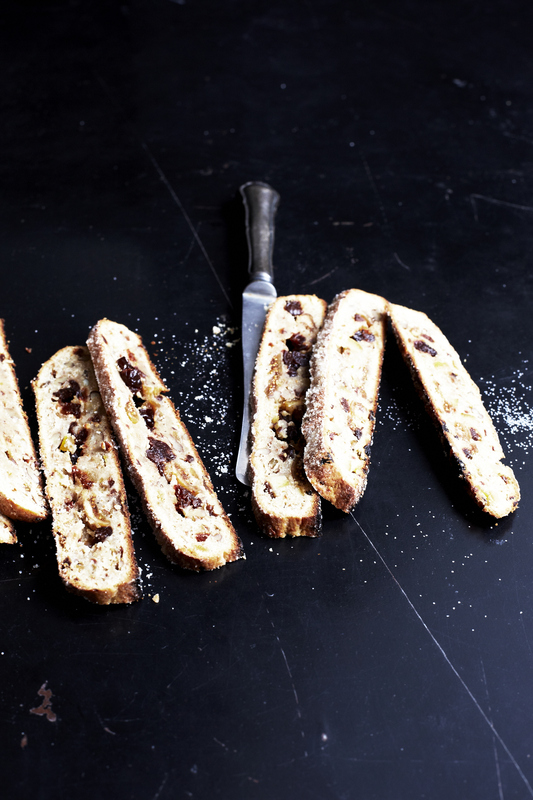 I have been thinking about stollen recently too, it reminds me of Christmas with my grandparents. These are beautiful. 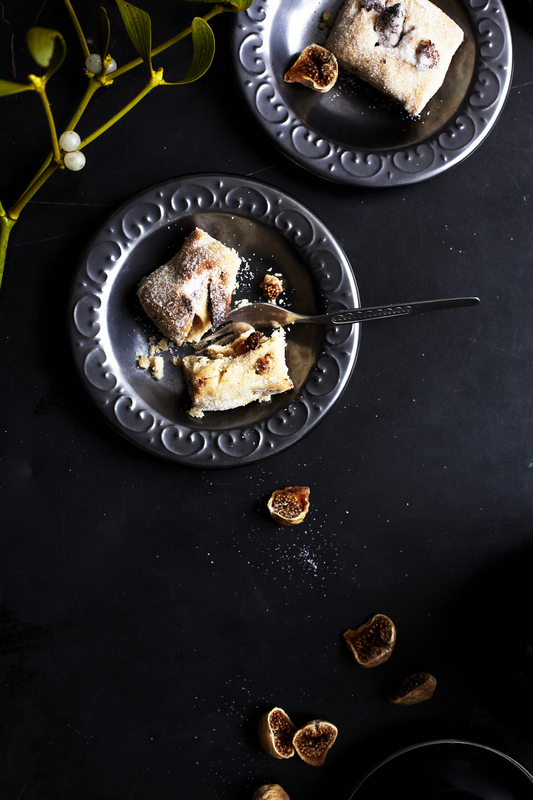 I’m all about throwing wonderful winter spices in with dried fruits and then baking them! The photos really make my mouth water. I have to give these a shot. noch ist ja Zeit das er schön durchziehen kann.